Fitsum Weldegiorgis explores how artisanal and small-scale mining (ASM) can make a positive contribution to achieving the Sustainable Development Goals. Artisanal and small-scale mining (ASM) is often seen as an unwelcome activity that degrades the environment, and has a negative impact on communities. The sector, however, directly involves an estimated 25 million people (indirectly supporting 150 million), and provides essential livelihoods in some of the world's poorest and most marginalised regions. As colleagues convening at the Intergovernmental Forum on Mining, Minerals and Sustainable Development (IGF) in Geneva this week will discuss, ASM could make a significant contribution to sustainable development and to achieving the United Nations' Sustainable Development Goals (SDGs) – if people-centred planning and responsible management are put at the heart of it. The mining industry is often thought of in terms of large- and medium-scale operations, but ASM makes up a considerable part of the sector. While the industry as a whole is criticised for its negative impacts and limited influence on poverty reduction, large-scale mining is acknowledged as making a positive contribution towards economic growth. In contrast, the economic importance of ASM is often ignored. In recent years, however, there have been some efforts to harness this economic potential and to promote sustainable development within the sector. Governments, civil society groups, development practitioners, the UN, the International Finance Corporation and other international bodies, for example, seek to develop a model agreement to encourage mining companies to adopt principles and practices that protect people and the environment in the investment contracts which set the terms for their operation. While this progress can be applauded, there is still an enormous challenge ahead. All 17 of the UN's SDGs (PDF) are relevant to both the negative and positive impacts of mining, including ASM, and can therefore provide a new focus and increased ambition to channel the industry for sustainable development. Environment, health, and safety (SDGs 3,4,6,12,13,15): Unsafe and irresponsible use of poorly-maintained, rudimentary equipment and hazardous chemicals is common in ASM, and often leads to land degradation and air and water pollution, as well as to serious injury and chronic health problems. Many of these issues could be addressed by providing safe and effective equipment and building the capacity of those working in ASM to adopt safe work practices. Social wellbeing (SDGs 1,2,5,10,11,16): An influx of miners into an ASM area often increases the level of alcohol and substance abuse, risk of conflict and violence, abuse of women and children, and levels of sexually transmitted diseases. Strong local groups and institutions can help to build the community cohesion and resilience that is essential to implement sustainable development programmes. ASM usually co-exists with agriculture, competing for land, water, and productive capacity, and impacting on local food supply. Strong local institutions could also guide efforts to maximise productivity from both mining and agriculture and ensure long-term food security. Productive ASM would enable households to pay for education and health care expenses. 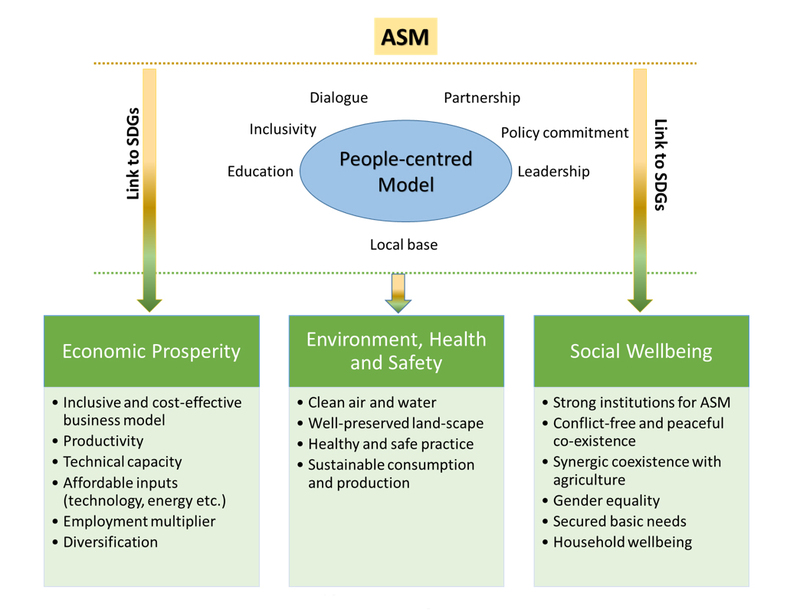 Economic prosperity (SDG 7, 8, 9): Ensuring ASM is productive and sustainable will ultimately require the design of an economic model around ASM, which will promote income-generating opportunities by providing access to skills, finance, and markets. The development of such a model will require multi-stakeholder consultation in which ASM communities have a strong voice, and a comprehensive mapping of the sector including: scale, productivity, value chain, mineral reserves and ore-quality; demography of miners and households; land, water and energy resources; ASM policies and practices; and international markets and prices. A well organised and managed ASM sector would also position miners to diversify into more sustainable and stable economic activities such as agriculture in the future. Ensuring responsible mining and harnessing ASM's potential for sustainable development demands a collaborative approach that can only start with engagement across the sector. IIED has already begun such a process through a programme of locally owned 'dialogues'. Backed by research and stakeholder engagement, these dialogues result in mobilisation of sector leaders in a Learning and Leadership Group (LLG) to take forward agreed solutions. IIED dialogues started in Ghana, where the LLG is working on a 12-month work plan to embark on participatory sector reform. The dialogue methodologies are now being used in Madagascar by a GIZ-led programme, and additional dialogues and global knowledge transfer activities are planned for Tanzania. This week's IGF meeting provides the opportunity to share this work with environment and development colleagues, and make the case that – with appropriate planning, consultation, and leadership – ASM can contribute to reducing poverty and achieving the sustainable development goals. Fitsum Weldegiorgis (fitsum.weldegiorgis@iied.org) is senior researcher in IIED's Shaping Sustainable Markets research group.